Leslie Stephen was born in London. In his youth he suffered from bad health (he was said to have an overactive brain). In 1842 he was sent to Eton, but he didn't do well there. In 1848 he entered King's College in London, but he left in 1850. He moved to Cambridge, where was coached by Llewelyn Davies before he entered Trinity Hall. There he recovered quickly and apart from mathematics he studied literature. He was also a fine sportman. In 1854 he became a fellow at his college and as part of the job he was expected to take holy orders as well. So he duly became a priest in 1859. By now he was also a fine athlete and he won the mile race at the athletic games of the University in 1860. In 1861 he climbed the Mont Blanc and in 1862 and later years more mountains would follow. After reading Mill and Kant he had to resign his tutorship because he refused to attend chapel services (in 1875 he would formally relinquish his orders). He was able to keep his fellowship at the University. From 1866 onwards he wrote literary criticism for the "Cornhill Magazine". In 1867 he married Minnie, a daughter of the writer Thackeray. Several volumes of his criticisms were published during the 1870s and in 1871 he became the editor of the "Cornhill Magazine". He published the work of young writers like Stevenson, Hady, James and Gosse. After Minnie died in 1875 he married Julia Prinsep in 1878, who gave him four children, among them Virginia Woolf and Vanessa Bell. In 1881 George Smith proposed a new project to him that would result in the Dictionary of National Biography. Stephen became the editor of this prestigious project and the first volume appeared in 1885, followed each quarter by a new volume. After his health started to fail he resigned from the editorship, but he was still an important contributor, writing over 1000 pages in total. 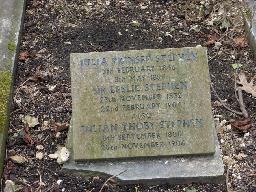 Stephen was struck with grief when Julia died in 1895. During the last years of his life he was elected a member of several important institutions and he became "Sir" Leslie in 1902. The grave of Sir Leslie Stephen at Highgate Cemetery (East), London. 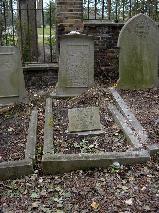 His wife Julia was buried there in 1895 and after his death in 1904 his ashes were scattered over the grave. The grave of Sir Leslie Stephen at Highgate Cemetery (East), London.